Stephanie Edgley is a normal, if a bit antisocial, 12-year-old. She has normal parents and lives in a normal house in Ireland. Her Uncle Gordon, however, was not so normal; an author of horror novels, he lives in a large, old house and tends to keep strange company. That is, until he dies. To the surprise of everyone, Stephanie is named Gordon's sole heir to his estate and fortune. It is at this point that things start to get interesting. 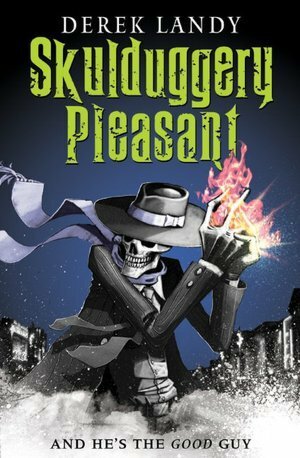 She meets one of Gordon's strange friends, a Mr. Skulduggery Pleasant, who, as it turns out, is a skeleton (long story)—and she announces that she is going to help him find her uncle's killer, since she's pretty sure he was murdered. What follows is a madcap adventure to, of course, save the world from evil forces. This was an exceptionally entertaining and darkly funny middle-grade/teen novel. It's the first in a series, and I will most certainly be checking out the rest of the books. This is indeed a very dark book, full of death and tragedies, but Landy keeps it age-appropriate and keeps gore to a minimum, though some not-so-likable characters meet deliciously gruesome demises. Landy has created a world where magical beings coexist with non-magical humans, with the latter more often than not being none the wiser. It's similar in that sense to Harry Potter, but there the similarities end. Magical folk live in a dangerous world, where a war between those who seek power and those protecting the general population has been waged for decades (probably longer, I can't remember exactly, but a really long time). At the time we join the characters in their story, both sides have agreed to a tenuous ceasefire, which of course blows up in everyone's faces, otherwise there would be no story. As for characters, these are all brilliant. Skulduggery is stoic but with an incredibly wry humor, and Stephanie has some excellent zingers too, along with her determination, stubbornness, and incredible courage. They are, to put it simply, awesome. Oh, and they are both great fighters, which we get to see a lot of. I listened to the audio version of this book narrated by Rupert Degas, and it was fantastic. Degas was excellent at distinguishing voices, and paced his narration perfectly. Plus he has an accent. Long story short, if you like dark, humorous, action-packed fantasy, this is a great series to start. Disclaimer: I borrowed this audiobook via OverDrive from my local library. I keep seeing these books, and wondering if I would like them. Now I am definitely going to check them out... as soon as I get some of my other 'must-read' books read. Sounds amazing! But isn't it a bit childish? Or is it okay to read if you love Harry Potter, but read more adultlike books?